Temperance Brennan returns in this forensic anthropology mystery, Flash and Bones. 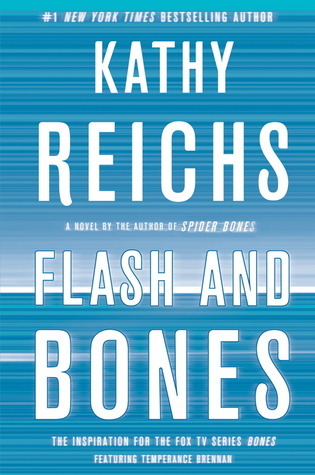 For those of you who are unfamiliar with Kathy Reichs’ work, Flash and Bones is the 14th novel in the Temperance Brennan series, which circles around a Forensic Anthropologist who helps to identify bodies that are damaged beyond recognition or skeletons in the U.S. and in Canada. This series brought about the very popular mystery television series called Bones. Flash and Bones takes place in Charlotte, North Carolina, during Race Week. A body is found in the local dump, near the race track, and some unsolved mysteries from decades past resurface. It’s up to Tempe to sort through the clues and find an identity for the body, despite the fact that the FBI seems to want her off the case. Some very shady individuals are hanging around the race track lately, and one man claims that his sister who disappeared decades ago was murdered, and it has something to do with the last place she was seen-the track. Will Tempe solve the murder before the murderer gets his hands on her to keep her quiet? What is the FBI trying to cover up? If you like murder mysteries and don’t mind reading about them from a Forensic/Medical Examiner kind of vantage (it can be very descriptive), then you will want to check out this series. I suggest you start at the beginning, however, if you want to give them a try. (Otherwise her love life doesn’t make much sense).